Below is an overview of what the ECM Deals Committee is. 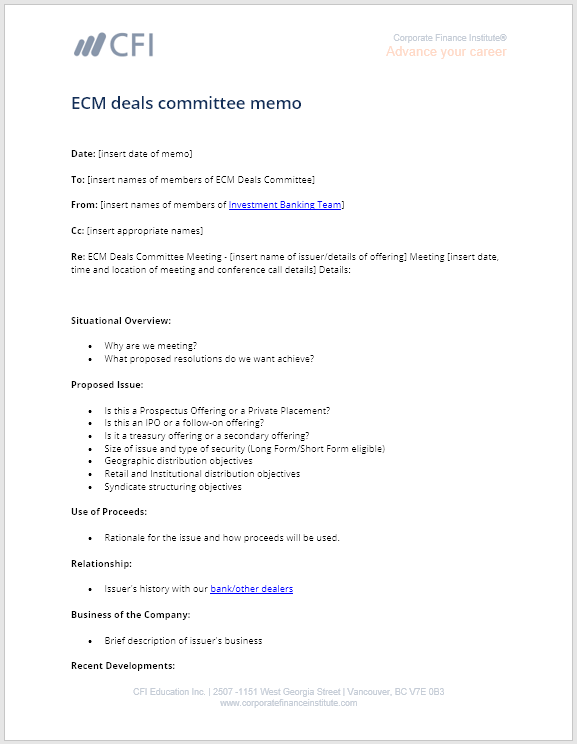 What is the ECM Deals Committee? The Equity Capital Markets (ECM) Deals Committee assesses the financial and business merits of any proposed New Equity Issue to determine whether a bank will become involved in the New Equity Issue. Except in the limited circumstances described below, most banks will not commit to any New Equity Issue without obtaining approval from the ECM Deals Committee. In determining whether a bank will participate in a New Equity Issue, the ECM Deals Committee will consider the financial and business merits of the transaction, the related underwriting risk, and the impact of the transaction on the bank’s franchise. To obtain approval from the ECM Deals Committee for a New Equity Issue, the Investment Banking TeamInvestment Banking Career PathInvestment banking career guide - plan your IB career path. Learn about investment banking salaries, how to get hired, and what to do after a career in IB. The investment banking division (IBD) helps governments, corporations, and institutions raise capital and complete mergers and acquisitions (M&A). Analysts work 100 will prepare and submit an ECM Deals Committee Memo to the members of the Committee for their consideration. The ECM Deals Committee meeting typically requires participation by the Head of Equity Capital Markets, a senior representative of Equity Sales and Trading,Sales and Trading Career ProfileThe sales & trading division (S&T) of an investment bank helps mutual funds, hedge funds, pension funds, etc. facilitate equities transactions (buy/sell). A career in sales & trading can be extremely strenuous with a very fast paced environment. The competition for positions is intense, compensation can be very high, and a senior representative from Investment Banking who is a member of the relevant issuer’s industry group. In addition, if a representative of Research participates in the Deals Committee meeting, a representative of the Legal Department should also attend the meeting. An Equity Capital Markets ECM Memorandum is an internally created document used at an investment bankInvestment BankingInvestment banking is the division of a bank that serves governments, corporations & institutions, providing underwriting (capital raising) and mergers and acquisitions (M&A) advisory services. to approve (or reject) a potential transaction such as an IPO, follow-on offering, etc. The ECM Memo is prepared by the investment banking divisionIBD - Investment Banking DivisionIBD is an acronym for the Investment Banking Division within the overall investment bank. IBD has responsibility for working with corporations, institutions, and governments to carry out capital raising (underwriting in equity, debt, and hybrid markets) as well as for executing mergers and acquisitions and sent to the ECM team. Learn more, with CFI’s free ECM Memo TemplateECM Memo (Equity Capital Markets)ECM deals committee memorandum. An example of an Equity Capital Markets ECM Memo template to approve a potential investment banking transaction.